Ralph Dudley Stevens, 95, of McCook, died on August 20, 2018 in the McCook Community Hospital. Ralph was born on November 26, 1922 to Ralph G. and Ruth (Ebert) Stevens in McCook, Nebraska. 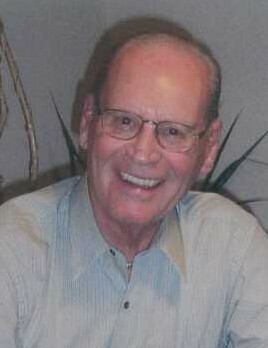 Ralph was the owner and operator of Stevens 7up Bottling Company in McCook. Ralph graduated from St. John’s Military Academy of Salina, Kansas in 1940 and attended the University of Nebraska, Lincoln. He enlisted in the Navy on October 28, 1942 and started his active duty in February 4, 1943 where he served in the South Pacific during World War II. During his time in the military he received the Bronze Star. Ralph was discharged from the Navy on April 7, 1946. He and Elaine (Peters) were married on August 9, 1947 at St. Alban’s Episcopal Church. He was also a member of the Kiwanis and Optimists Clubs. Ralph had many hobbies which included golfing, gardening, woodworking, stained glass, painting, crossword and jig-saw puzzles, reading and many other various activities. He is preceded in death by his parents and wife Elaine (Peters) of 66 years. He is survived by his daughters; Candace (Ted) Fellers of Lincoln, Debra Stevens of McCook, four grandchildren; Scott (Jenny) Fellers of Parker, CO, Kylie (Travis) Usher of Lincoln, Nathan (Lissa) Fellers of Lincoln, and Shannon Stevens of McCook. He is also survived by 7 great grandchildren. A Celebration of Life will be at a later date due to his wishes of cremation. In lieu of flowers, memorials may be left to the McCook Community Hospital; 1301 East H St. McCook, NE 69001 or The McCook Humane Society; 100 South St. McCook, NE 69001.